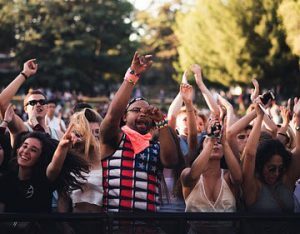 For open-minded skeptics, the idea when considering any unusual situation that defies explanation, is to consider all possibilities, and allow the one with the most evidence and greatest probability to rise to the top. However, in the case of Steve Jackson and his NWO Cards from the 90s, it isn’t quite that cut and dry. Here at Top Secret Writers, we’ve covered the Illuminati frequently, and even mentioned Steve Jackson games before as well. For sane researchers, the concept of the Illuminati is a historic one. The question of a New World Order is one of global politics and a well-known power structure. However, predicting the future with a set of playing cards from 1995? That is just surreal to the nth degree. In 1995, game designer Steve Jackson created a playing card game targeting the age-old conspiracy-theorist’s favorite conspiracy – the Illuminati. The title of the game was Illuminati: The Game of Conspiracy. At the time, the game just appeared as thought it was any other innocent card game. All you had to do was play the part of an Illuminati member. You were the master of the world, launching all sorts of actions to manipulate the world and accumulate your own wealth in the process. What sort of attacks could you orchestrate to manipulate the world? You could bomb the Pentagon, create and release deadly diseases, or launch nuke attacks. All were false-flag attacks meant to manipulate world governments into military action, move the population to violence, and funnel the resulting cash flow from all of it into your own coffers. Okay, maybe not so innocent, especially when you take a closer look at some of the cards. For example, here is the card for a “nuke attack” against tall buildings. Kind of surreal, right? Twin towers, getting struck at one of the upper levels, with an explosion illustrated nearly identical to the actually 9/11 attacks by terrorists with jet planes fully loaded with fuel. Conspiracy theorists around the world have been writing about this card for quite some time, claiming that it “predicted” the future attack of the World Trade Center on 9/11. How could Steve Jackson have known that the attack was going to occur when he created the game in 1995? Most people are convinced at first glance. The ease with which people get convinced of this is probably more from lack of education than from a prophetic vision of the future on the part of the game maker. Why? Well, leading up to 1995, there were countless terrorist attacks and bombings around the world. 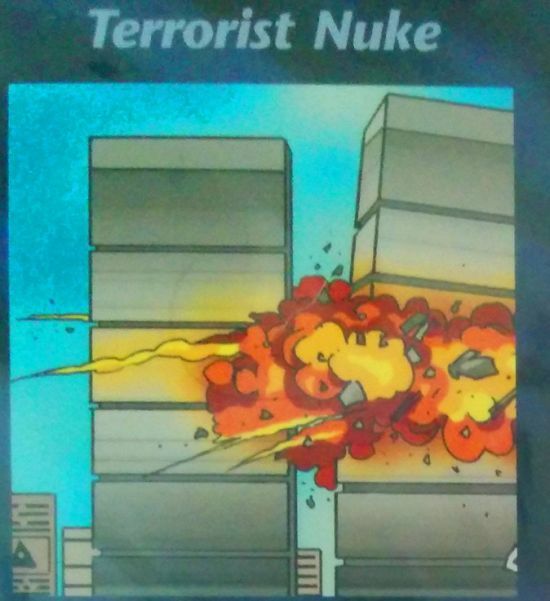 In fact, most people old enough will remember that the World Trade Center was actually bombed in 1993, two years before Steve Jackson created his board game. Of course the bomb – with the explosive power of 2,200 pounds of TNT – went off in the basement parking garage of the North Tower. But the images portrayed an explosion on the upper levels of the building. How could Jackson have predicted this? Well, the reality is that the Trade Centers were frequent targets of terrorists. In fact, well-known terrorist Ramzi Yousef was arrested on February 7th, 1995 by Pakistan and U.S. authorities in room 16 of the Su-Casa Guest House in Islamabad, Pakistan. The trial revealed all of his plans, including one in January of 1995, where he met with associate Istaique Parker. He had told Parker to check two suitcases on a Delta flight and on a United Airlines flight, both filled with bombs. The plan fell through. Correlating Youself’s two plans made it easy enough to imagine a bomb striking one of the upper floors of one of the twin towers – but still, the uncanny similarity of the illustration to the actual WTC attack is a bit unnerving. 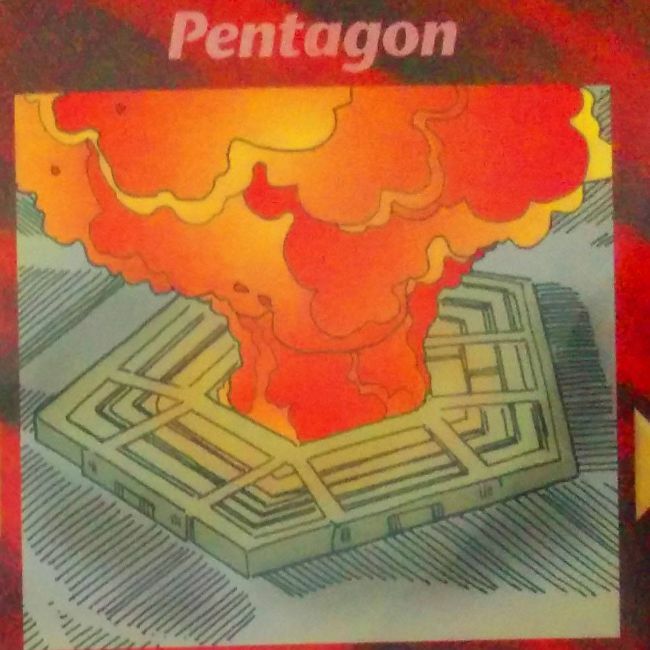 Then there’s the Pentagon attack playing card. The Pentagon attack is a whole other story. Little, leading up to 1995, would provide any clue to any citizen, that this was even a remote threat on the radar of anyone out there. Throughout the 80’s, there were countless hijackings and airplane bombs against flights like a TWA airliner and an Egyptair plane in 1985, another TWA bomb in 1986, and a Pan Am 104 bomb in 1988. The closest thing to an attack on a federal building was the April 19th, 1995 car bomb that destroyed the Murrah Federal Building in Oklahoma City. That said, there was in fact information available in 1995, when the U.S. government received warnings from officials in the Philippines that bin Laden and his associates were planning to crash hijacked airliners into the Pentagon and the World Trade Center. This information was passed to the FBI by Philippine investigators who had questioned Ramzi Yousef’s associate Abdul Hakim Murad, after his arrest following a small fire in Ramzi Youself’s Manila apartment in 1995. However, the fact that there were plans to attack the Pentagon in 1995 doesn’t prove anything about the creation of this playing card the same year, unless Steve Jackson had contacts inside of the FBI, which is doubtful. The rest of the cards were really nothing very surprising – simply touching on the age-old fodder that made up conspiracy theory for decades leading up to 1995, including topics like global disease epidemics, floods, Wall Street corruption, manipulation of world hunger and corporate greed. But those two images – the Pentagon bomb and the Twin Tower bomb – are difficult to explain away. So who, exactly, is Steven Jackson? Jackson was a child of the 70’s, an era largely considered a booming period in the world of conspiracy theories – probably in large part to government secrecy surrounding Vietnam operations, and hints leaking about the government’s research into psychic abilities. Jackson graduated from Rice University in 1974, started Law School, and then dropped out to get into game design. In 1976, as a developer at Metagaming Concepts, designed the game Ogre in 1977, and G.E.V. in 1978. His Illuminati game designs really only started in the 1980s, with a game titled Illuminati in 1983, which he created for Steve Jackson Games. Here’s where things got interesting. On March 1, 1990, the federal government turned on Steve Jackson. 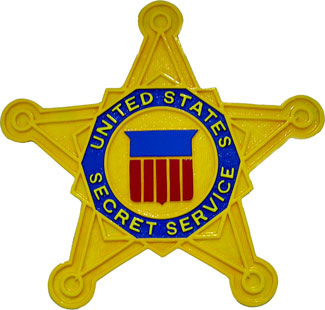 The Secret Service raided the Austin, Texas offices of SJ Games on suspicions one of his game designers, Loyd Blankenship, was involved in illegal hacking. Blankenship was a moderator at a hacking bulletin board system known as “The Phoenix Project”, which had published stolen documents detailing the government’s new 911 emergency response system. Blankenship told Vice.com that Jackson had always had a healthy interest in conspiracy theories. It isn’t hard to see why Jackson might have decided to start producing a great number of NWO-Illuminati game designs in the years immediately following this raid, considering that the Secret Service seized property of Jackson’s, including several game designs, including his manuscript for GURPS Cyberpunk. When he went to retrieve his manuscripts, the Secret Service told him that the book was a “handbook for computer crime”. Jackson eventually sued the government with the help of the Electronic Frontier Foundation. The trial in 1993 resulted in Steve Jackson Games being awarded $50,000 in damages, and the government had to pay his $250,000 in attorney fees. The judge reprimanded the Secret Service for preparing a warrant against an organization where there was no basis for suspicion of wrongdoing. At the time of the raid, there was a 1990 U.S. Secret Service operation in 1990 called Operation Sundevil – a massive crackdown on the newly forming “illegal computer hacking” field – resulting in raids, arrests and property seizures across the country. While the raid was not actually a direct part of Operation, its timing implied that it was likely inspired by a strong desire within the agency to target any and all organizations related to hacker bulletin board systems. It’s highly likely that the raid and subsequent trial only fueled Steve Jackson’s interest in conspiracy theories, and of course inspired his increased creation of various versions of the Illuminati-NWO game series. So how did Jackson get those card images so spot-on with future events? According to Blankenship, Jackson simply lucked out with two of the many card designs in the set. Another card illustrator, Dan Smith, told Vice that Jackson dabbled in “occult mastery”, which inspired his card ideas. How true this claim is, is uncertain. So what do you believe? Were the eerily accurate designs just the result of coincidence and luck, or were they the result of some super-secret global society channeling their future master plan ideas into the head of Steve Jackson through occult means? I’ll let you judge the probabilities and evidence of this particular mystery on your own. I agree, at first glance and without thinking about it objectively or rationally it does reek eerily of some foreknowledge or he has the abilities of some kind of modern day seer. In reality though is it such an awesome and staggering coincidence that two of the possible false flag attacks he imagined in this card game would be an attack on an economic icon i.e The World Trade Centre (which as you already mentioned had been attacked a few years earlier) and that other pillar of US might the military. If you asked 100 americans for an iconic military/security establishment I imagine a good percentage would say The Pentagon. Therefore in a collection of imagined false flag attacks the likelyhood of The WTC and The Pentagon being included is pretty good making the coincidence nowhere near as impressive as it did at first glance. Also if you are going to illustrate these attacks and show an explosion at the WTC where would you put it, at the base, the roof or somewhere in between.I know which appears more dramatic.Shouldn’t The Pentagon have smoke. belching from the side rather than the centre if it’s to some kind of signpost for future calamity. Of. course something like this will be latchedd on to with unwarranted fervour with many, many people unable to grasp how this could be an innocent occurance but that’s because we’re in the post 911 era and everything is screened through the Twin Towers filter making the slightest angle or aspect surrounding the WTC of particular significance way beyond what it actually deserves. Probably Ebay at this point. It’s pretty old. This is nothing surprising … there were lots of images of the upper floors of the twin towers on fire in various media prior to 911. It appears that the Illuminati (or more, precisely, the Bilderbergers) were setting up this massive psychological operation for at least a decade. In fact, the 1993 bombings may have been a test to see if the towers could have been brought down from below with conventional explosives, or perhaps it was merely a psychological setup. It has been well-documented that the WTC did not have a lot of tenants in its history and that many of the ones it did were involved in black financial operations. Some theorists believe the WTCs were intended to be brought down from the start and their fall was conveniently timed to get Americans behind our failed Middle East incursions since 911. The best theory is that Jackson was part of the Bilderberger circle all along. The White Dragon Society – Sincere Lunatics or Dubious Frauds?